WEST POINT, N.Y. -- The University at Buffalo wrestling team competed at the Black Knight Invite on Sunday and the day was highlighted by Jason Estevez winning the 149 lb. title. As a team, the Bulls finished fifth with 54 points at the event hosted by Army West Point. 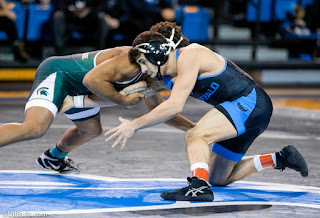 Estevez had an impressive route to the title, beating two top seeds along the way. He opened with a 2-1 decision over third-seed Brock Port of Lock Haven, followed by a 12-8 decision over second-seed Jon Ross also of Lock Haven. In the title match, Estevez earned a 5-3 decision over Columbia's Riley Jacops. Heavyweight Jake Gunning also worked his way into the finals before forfeiting the first-place match for precautionary reasons. Gunning, the second seed, opened with a second-period pin over Cal Poly's Sam Aguilar. He followed with a 4-2 sudden victory over third-seed Ben Sullivan of Army in the semifinals. At 125, Kyle Akins bounced back from a semifinal loss to win his next two matches and take third place. Akins took a 5-2 decision from Binghamton's Audey Ashkar and then, in the third place match, earned an 8-2 decision over Willy Girard of Bloomsburg. Brett Perry took fifth place at 197 lbs. He earned a 3-2 decision over teammate Sam Schuyler in the fifth place match.